There were effectively two Mott The Hooples: the one that had a hit with All The Young Dudes and enjoyed a kind of glam-rock chart success in the mid-70s, and an earlier one that never made it yet recorded some great, almost-lost rock albums as the 60s became the 70s. 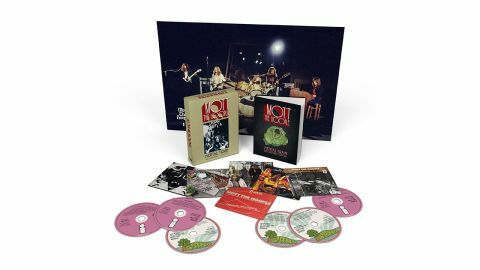 It’s that first Mott The Hoople who made the records in this new box set: their four albums for Island Records, along with a rarities set and a live disc, from a time in the band’s career that has never been properly anthologised; eighty-nine tracks, six discs, a wealth of new material including BBC sessions, studio out-takes and live shows, and, as if that wasn’t enough, excellent, insightful notes from former Mott fan club boss Kris Needs. Before David Bowie threw them a new career in 1972, Mott’s guiding light was, in part, Guy Stevens, the extraordinary half-mad, half-genius producer who turned Mott’s chaotic, thrashing sound into thunderous but intimate rock’n’roll (he later pulled a similar trick with The Clash), but also themselves. Almost from the start they were a self-aware (if never ironic) band, who understood more than most that the band and the audience were the same (‘We were the dudes and the dudes were we,’ Ian Hunter later sang). Their records sometimes sounded as though there was something missing – and that something was the audience. Mott live were a pulpit for Ian Hunter, a communal experience and the very definition of post-60s rock’n’roll. Their biggest rockers – Rock’n’Roll Queen, Walking With A Mountain, Thunderbuck Ram, even the nutso Death May Be Your Santa Claus – were indebted to both Dylan and the Rolling Stones, but had a swagger and attitude all of their own. This collection takes in every aspect of the first Mott, from beautiful ballads like Waterlow to the country-rock sidebar of Whisky Women, throwing in some early takes on the future (a tentative One Of The Boys, a far from tentative Black Scorpoio (Momma’s Little Jewel), and shows just why this band were so great. When the later Mott sang about Mott The Hoople on The Ballad Of Mott The Hoople and Saturday Gigs, this was the band they were singing about.